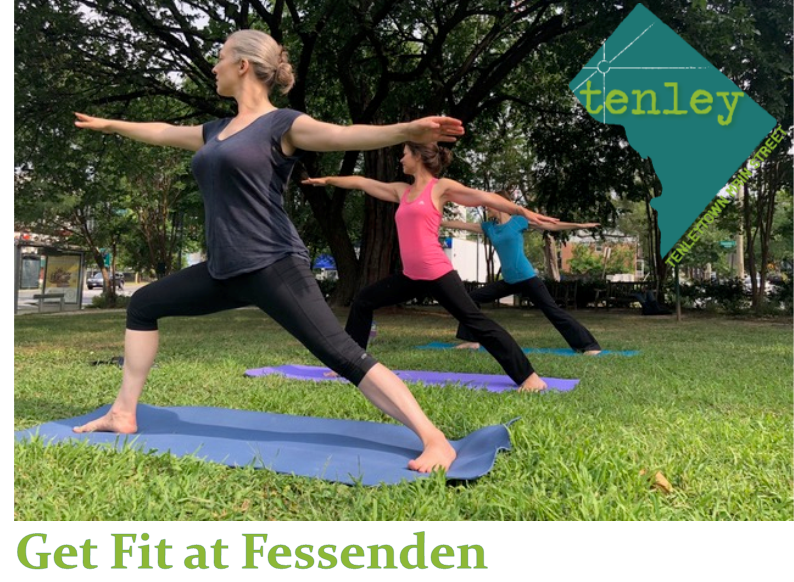 Low-impact fitness classes every Saturday morning at Fessenden Park, offered by Tenleytown Main Street and the Friends of Fessenden Park, in partnership with: CorePower Yoga, Haute Bodhi, sport&health, and the Washington Yoga Center. All fitness levels welcomed! Click the Schedule tab above for a listing of this season’s Get Fit at Fessenden classes and links to register. The all-volunteer Friends of Fessenden Park is a committee of Tenleytown Main Street that seeks to revitalize the park as a true community gathering place for people of all ages. Fessenden Park is bounded by Wisconsin Avenue, Fessenden St., and 42nd St. The park is equidistance from either the Tenleytown-AU Metro station or the Friendship Heights station, and is located on multiple Metro Bus lines. A Capital Bikeshare station is located at Fessenden Street and Wisconsin Avenue, next to Citibank. Metered street parking is also available. In the case of rain, the class will be canceled. Registrants will receive credit for a future Get Fit at Fessenden class at the park. There is a suggested donation of $10 for each class. Please bring a mat and water with you. All proceeds support programming and maintenance of the park by Tenleytown Main Street and the Friends of Fessenden Park. Unroll your yoga mat for an invigorating full-body flow where you’ll explore the yoga postures and fundamental principles of Vinyasa yoga. A foundation-building yoga class that will work every muscle through movement and breath at a moderate, but intuitive pace. Join Maggie Doctors of Haute Bodhi for a dynamic vinyasa flow class. This challenging yet fun flow will get you just outside your comfort zone with new twists on classic Hatha Yoga postures. You’ll increase the range of motion in all your major joints with gentle fascial stretch periodically worked into the flow. This class is perfect for beginners and seasoned practitioners alike! Find the balance between strength and flexibility with Sydnea from the Washington Yoga Center. Repeating a series of flowing postures between longer holds of static postures, movement is coordinated with breath. Inspired by set sequences of postures designed by Sri Dharma Mittra. May 25: No class. Memorial Day weekend. July 6: No class. Fourth of July weekend.